by the Taliban in Afghanstan. The purpose was to conceal an ancient county border that has existed for centuries and to try and support a half-baked local government reform from the early seventies. Yes, defacing ancient monuments reminds us of the Taleban extremists, but trying to erase or rewrite historical boundaries reminds me personally of East Germany, where the Länder were replaced in 1952 by administrative districts. You weren't allowed to talk about the old borders and no GDR maps showed them. The Länder were restored after reunification in 1990. When are our ancient county boundaries going to be acknowledged again? More on this subject soon. and used to travel in the early days from Wythenshawe to Ancoats by bus. 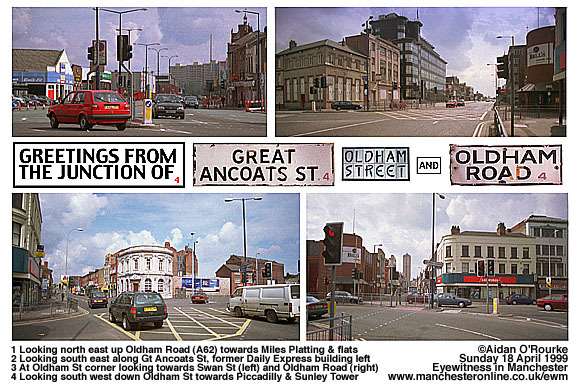 Having walked from Piccadilly bus station into Oldham street. there used to be a paper seller there whose name I think was Johnny, he had no legs ,and sat on a wooden platform that was fitted with castors, and come rain hail or snow he was always there, and I wondered if anybody had any information about him. 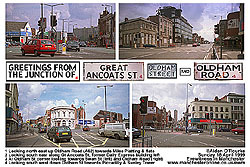 Regarding New Cross, at the juction of Oldham Street/Oldham Road /Ancoats Street/Swan Stree. I remember in Oldham Road at that point were underground public toilets, and I am sure that there used to be a cross. A great book to read if people haven't read it is the "Manchester Man" the auther is a lady and is well worth reading. I believe the name New Cross - applied to the junction of Oldham Street and Great Ancoats Street - has something to do with this area being a burial ground. Can anyone help? Also, a church with a very distinctive tower used to stand on Oldham Road on the left, to the right of the white bank on the corner. I am Salford born and b(red) but moved away 11 years ago to live here in the North West of Ireland after spending the first twenty odd years of my life in and around Kersal, Lower Broughton and Pendleton. I wasn't sorry to leave as the area was going downhill fast...you know the score...all the bars I drank in were being closed down due to protection and drugs. Also any vestige of community spirit had gone down the drain a long time ago and Thatcher was the last nail in the coffin. Seeing your pictures is great reminder to me of places where I lived and loved .got drunk, threw up, fought and ran and of course some of the great and not so great people that populated the areas that some of your pictures portray! I tell everyone I know here that my claim to fame is that I actually lived in one of the flats that appear in the opening credits of "Coronation Street"...sad I know. I get over as much as I can to see United and "me Mam" -in that order- and while its always nice to see Salford again and friends that I went to St. Alberts with, it wears off pretty quick when I see whats happened to the likes of "The Kings Arms" on Whit Lane and "The Bridge" on Lower Broughton road, places that gave me so many memories, good and bad. Usually I'm glad to get back to Derry where I can see the hills of Donegal from where I live and fantastic beaches that are only fifteen minutes away. Having said that I'll always be proud to come from Salford especially when some drunken Leeds-shirt wearing eejit of a Derry man tries to give me abuse about supporting United. Giggs' goal in the semi-final against Arsenal was my all time moment...Captain of Salford Boys so he was! Keep up the good work because the pictures are very evocative of a previous life (not only of mine) and I believe that this kind of work is essential if we are to keep a handle on the past and know where we came from, so that Manchester and its people can move forward in the right way. If I offered a prize for reader messages, this one would get it! I'd be very interested in visiting where you live now and photographing/writing about it - I know a lot about that part of the world, but have never been there. Hope you like the misty romantic sunset over Strangeways and Salford. My claim to fame: I lived in the tower block in the distance on the left - Thorn Court - from late 84 to Dec 95. You can almost see the windows my old flat - on the 19th floor, four down from the top, on the left hand side! I lived in Manchester up until 1996 then moved to Fleetwood. I used to go to St Mary's Secondary School in Stetford and still have family in Manchester. I only get down once a year I would like to see any old photos in and around Old Trafford. 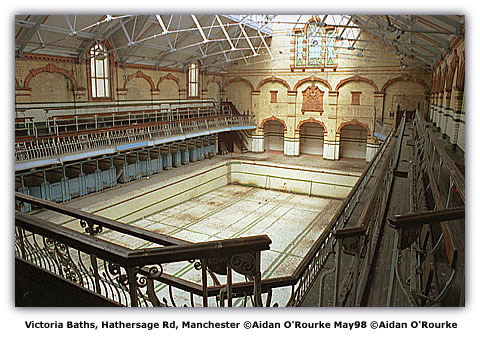 Message: As usual Aidan you have surpassed yourself with all the new photography.ie, Saddleworth etc. However although as a kid we went on adventures up th'moor, it was tragedy that took me back there when I was a police officer, looking for bodies after the discovery of the moors murderers, a sad and terrible time. But this should all be wiped out by the imaginative work you are doing all over the area. Keep it up. Thanks very much for that - Yes, people have negative associations with places, but through my photography and writing, I hope to change peoples' perceptions. Message: Aidan, You always manage to outdo yourself. I wonder if you realise how well your site and all your endeavors are appreciated. I get E mails and letters from all over with mention if EWM. Don't ever stop! Fantastic job. More More, More....Please. Thank you and hello to all in Manchester and say hello and thank you to your lovely wife for allowing you the the freedom of time to pursue what you do. Thanks very much indeed for your comments - It really does make a difference to me. Many people here take their surroundings completely for granted and don't see the point of what I do, so I really appreciate your support. By the way, this is my job: just like any other freelance photographer or journalist I get paid to do it. My lovely wife is probably glad to have me out of the house so she can get a bit of peace and quiet! Here's a preview of another Saddleworth photograph - The larger size version will be included in the full feature. Your pictures of Quickedge in the article on Saddleworth brought back many happy memories for me - and also triggered a bout of homesickness! The latter I hope to alleviate on a visit home this Spring. I was a 14 year old newly enrolled in the 1943 war time work force when we moved from our home in Culcheth, Newton Heath, to the "wilds" of a small farm on Quickedge. At least it seemed like the wilds to a city bred kid like me. Quickedge House Farm is on the road between Upper Mossley and Lydgate, and was like a completely different country compared to the Manchester districts such as Miles Platting, Harpurhey, Moston, and Newton Heath where I had lived since my birth in Crumpsall Hospital. One of my biggest problems was trying to understand the local dialect, and that resulted in a number of embarrassing situations for me. It was in Mossley at the Woodend Mill of R.H.Buckley that I started my apprenticeship as an electrician, and where I was fortunate to be under the tutelage of some of the finest electrical craftsmen that I met in my fifty one and a half years in the industry. Most of my time with the company was spent at the Copley Mill in Stalybridge, and the bus ride from Mossley to Copley along the bottom of the hills gave views that I never tired of drinking in. I finished my apprenticeship at the Ashton-U-Lyne engineering company of J.C.Carlson, - with a break for National Service - and the ride from Upper Mossley to Ashton past Hartshead Pike gave more breathtaking views for my young city bred eyes. I live in another beautiful place now, but no matter how exotic the views I have encountered in my travels, for me, none can better the countryside of my native land. Thank you so much for being the eyes of expatriates such as myself and allowing us to keep in touch with the places of our childhood and youth. It's very interesting to hear the memories that pictures can provoke in the mind of a viewer. I guess that's the magic of photography - it taps into the mind, imagination and memory of the spectator. I have no childhood recollections of the Saddleworth area, but I'm very glad to be an intermediary for you. I've included another preview picture - looking up from the Saddleworth/Yorkshire border towards the higher part of Mossley, perched precariously on a hillside. Just wanted to let you know how much I have been enjoying your photographs of Manchester and the surrounding area. I lived in Sale, Cheshire until 1973, then Heywood, Lancs for a few years. Moved up to Scotland, living near Cumbernauld and working in Glasgow for about 5 years until 1981, when we moved to Ottawa, Canada. I've only been back to Britain twice since then, both times in 1992, and didn't get to do much travelling around. I love where I am now but I get really nostalgic looking at your wonderful pictures. I was amazed, but happy, to see a photo of the Sale Odeon in a past entry. I used to go there on Saturday mornings, like most kids, I can almost smell the hot dogs! Obviously Manchester itself has changed a great deal since the early 80's. I worked on King Street at The National Westminster Bank, in fact I started work there the day it opened. I have fond memories of the area around The Shambles, before it was moved, and spent many hours waiting for a bus at Piccadilly. I wonder if I would want to visit again now, our memories are precious to us (even if they are untrue). I have a book of old postcard scenes of Sale, and I suppose there must be other towns also, and wonder if you've seen any of these books yourself. Present day shots placed side by side with those featured on the postcards would be of great interest to me. The National Westminster Bank on King Street has been converted into a shopping venue. Above is the area round the Shambles as it looked from the early 70's until 1998. It's been a while since I last wrote, but I regularly catch your newsletters of course, being on your mailing list. I notice you have stopped saying a new Photo Serch medium is in the works, does that mean it is up and running? If so, how do I access the collection? I am asking because a TV Ad for a local Pizza company uses a photo that is yours I believe, a photo of a street - in Leeds possibly - where there has been a glass roof added over it to create a mall. I have tried accessing the collection but can't get photos any more recent than Week 30 of 1999 by going through the newsletter library. While doing this search I reread many of the old newsletters and came across your reference to Manchester being Hollywood North, or some such remark, correctly noting that many movies and TV shows are shot in the city and surrounding areas. Well Vancouver, BC is really the true Hollywood North, with in excess of 35,000 people being directly employed in the industry, along with many more individuals and comapnies in support roles. We have two major studios, Bridge Studios - where Stargate SG! is shot, and North Shore Studios which combine to produce countless movies and TV shows, amny of which you will be familiar with. For example, Pledge starring Jack Nicholson, Saving Silverman, Winona Ryders Little Women and Brad Pitt in Legends of the Fall. Double Jeopardy and The Accused (Jody Foster) as well as Romeo Must Die and Arnie's Sixth Day, I could go on and on. My brother in law works for Vancouver's Traffic Division and often works overtime to help with traffic closures and/or diversions to accomodate movie shoots. He lives in Steveston, a former Japanese dominated area of Richmond - they were dispossessed in the 2nd World War and sent to internment camps - that became a waterfront residential area of choice when the salmon cannery business in the area closed down. He was walking his dog on the waterfront when he bumped into a coloured gentlemen, he stooped to pet his dog and they had a quite long conversation about this and that, it was Morgan Freeman, walking alone while in town for his soon to be released movie Along came a Spider. The numbers of big name actors and other artists seen often in Vancouver is stunning and it isn't unusual to find yourself inconvenienced while driving near a shoot. One of the big attractions for Hollywood is of course the low level of the Canadian Dollar, which is worth only about 65 cents against the Yankee Greenback - a sad state of affairs - but it pumps countless millions of dollars into the Provincial coffers, but that can't seem to help our politicians make the books balance, it seems politicians the world over have the same problems. Mind you with an election in the offing, our Provincial Government has happily told us how they are making more millions by exporting electricity to energy starved California. Well that's about it for this missive, talk to you again soon. I am currently working on a design to run Eyewitness in Manchester on a database system. This will take some time to prepare and in the meantime, I would ask you to be patient. Running a website with over 2000 photographs and hundreds of articles is a big job, as you can imagine. Manchester City Council have a film office, which is supposed to help film-makers make films. Unfortunately, a film-maker I know once contacted them in connection with making a film in the Manchester area, with many scenes to be shot in Oldham. He was told that Oldham is outside the City of Manchester area and they couldn't help him. Until the Manchester area has one single authority rather than a number of separate and competing ones, many opportunities will be lost and Manchester will never truly become 'Hollywood of the North'. Yes, they were, in Prime Suspect 5, starring Helen Mirren. It was a gripping, but very tragic scene when a once health-giving facility closed due to local authority cuts became favourite place of drug dealer 'The Street' to carry out gangland executions. I'm not sure if the building in Belle Vue was used for exterior shots. 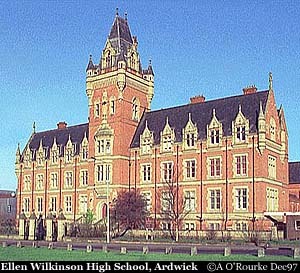 Your web site is superb, especially the Ardwick Tech picture, being an old boy from the fifties. The Ancoats subjects etc were a real eye opener. The pictures do not look much like I remembered them. A great deal has changed in the 30 years since we emigrated, but once a Manchester boy, always a Manchester boy. Looking forward to some pics of Clayton, Openshaw & Glossop. We did live in Bradford near the wire works before moving to Glossop then here. We would love to hear from anybody who has memories of Bradford 1960/70. I do believe the house where I was born has now been demolished. It was no 44 Bransford Rd Higher Openshaw. Nice to hear from you - I'll add those locations to my list of places to cover, particularly Glossop which I haven't featured yet. I contacted you some time ago in January, while searching for images of the Hollies School. You kindly pointed me towards the digital images catalogue at Central Library's Local Studies Unit. They were most helful and have found 7 images. Unfortunately none of the school at its original address in Upper Brook Street. Love the pictures of Ancoats - where I'm researching my family history. I've included a photograph taken 5 Mar 2001 looking towards Ancoats from a spot close to the Commonwealth Games site. Best wishes for your book and website.